The Pulitzer Arts Foundation of St. Louis commissioned SIUE alumna Patterson and her granddaughter, artist Eugenia Alexander, both of East St. Louis, to work in collaboration with the Project Success program in creating the piece. The idea was inspired by artist Ruth Asawa’s legacy of arts activism and education for children in San Francisco. The Pulitzer’s critically-acclaimed exhibition, “Ruth Asawa: Life’s Work,” was on display through February 2019 at its museum. The official hanging of “Expression of Love,” an indoor sculpture that measures 2 feet wide by 3 feet long, is slated for some time in April in Building D of the East St. Louis Higher Education Campus in East St. Louis, according to Project Success Program Director Precious Grimes. Learning also involved the students developing a better awareness of themselves, according to Patterson-Petty. More than 60 Project Success students worked from September-December 2018 in creating the sculpture. 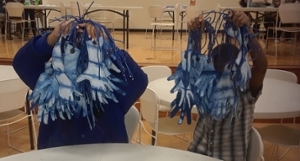 Patterson-Petty and Alexander instructed the students in the creation of hundreds of hands. Patterson-Petty and Alexander fashioned the “hands” on hooks and attached them to the chains and rings of the sculpture. The Project Success Program is a comprehensive after-school tutorial enrichment childcare program, which services children ages 5-14. The Illinois Department of Children and Family Services funds the program. It is designed to serve children who are in protective custody and are referred by the Department of Children and Family Services caseworkers. The program provides services to children living within the St. Clair County and Madison County areas. 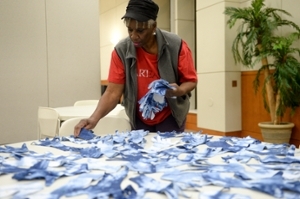 Internationally known fabric artist Edna Patterson-Petty, SIUE alumna, lays out the artwork of hands that will be fashioned into an indoor sculpture.